Your T-Shirt ($25) is your ticket to this fun event and is now available at The Thirsty Moose, and the Chamber of Commerce open 7 days a week. Please remember, you must wear or carry your event T-Shirt (logo visible) in order to participate. Included in the event passport is a voucher for one free appetizer. 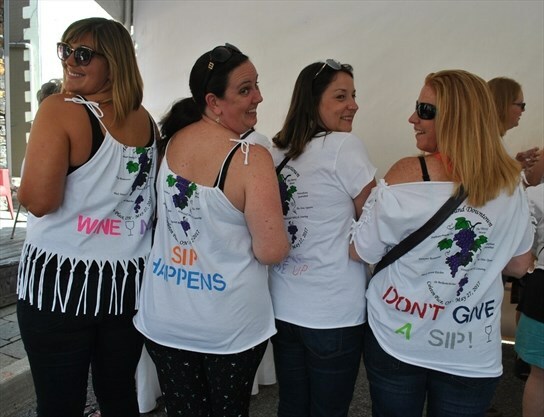 Anyone wearing a Wine’d Around Downtown T-shirt is entitled to purchase wine samples and appetizers at each of the participating venues for just $3 each. This annual wine and food tasting extravaganza is a fundraising event of the Carleton Place Sister City Committee for the Sister Cities Youth Exchange Program involving Carleton Place and sister cities Comrie, Scotland and Franklin, Tennessee. This year marks the 11th anniversary of the downtown wine- and food-sampling extravaganza. Last year a sellout crowd of 300 people took part. The venture runs from 1 to 5 p.m. and involves nine participating restaurants, pubs and caterers. There are two additions to the lineup this year. The Grand Hotel, at 7 Bridge St., and Sagar Indian Cuisine, at 156 Bridge St., will be dispensing delicious appetizers and wine samples for the first time as part of the activity. The Grand Hotel will also have a wine expert on hand to offer brief wine seminars to participants. Several traditional favourites are back this year. Waterfall Wedding and Event Catering will again be at Moore House. Stalwart Brewing Co. on High Street is also returning. Stalwart will join forces with the Black Tartan Kitchen, which will serve appetizers at the brewery. Other popular returnees are the Thirsty Moose, 20 Bridge St.; Chesswood Restaurant, 151 Bridge St.; and The Waterfront Gastropub, 12 Bell St. (across the river from the town hall). Tags: Carleton Place Sister City Committee.